Who invented the Steam Engine? The name of the person credited with inventing the Steam Engine is James Watt (1736 - 1819). James Watt is not only famous as the Scottish inventor of the Steam Engine but also as a scientific instrument maker and mechanical engineer. When was the Steam Engine invented? James Watt invented the Steam Engine in 1769, during the Industrial Revolution period of invention (1700 - 1860). The invention of the Steam Engine originated in Scotland is considered a paramount achievement and resulted in the rapid progression of the Industrial Revolution due to its adoption in numerous industries such as mills, distilleries, canals and waterworks. The electrical unit, the watt, was named in honor of James Watt. How a Steam Engine works: A steam engine is fired by a coal fire that heats a boiler full of water to make the steam. Steam is piped from the boiler into the cylinder where a piston which moves up and down because of steam pressure. The piston is connected to a drive wheel and drives the vehicle forward and the spent steam billows out of the chimney. Definition: The Steam Engine is defined as an external-combustion engine moved by steam in which heat is used to raise steam, admitted by the action of the valve gear, which either turns a turbine or forces a piston to move up and down in a cylinder. Fact 1: Who invented the Steam Engine? The Steam Engine was invented by James Watt in 1769 during the Industrial Revolution era of inventions (1700 - 1860) which was a momentous addition to advancements made during the Industrial revolution. Fact 2: Who invented the Steam Engine? Prior to the invention of the Steam Engine by James Watt in 1769, there were other inventions related to steam, with notable advancements made by Thomas Savery, Thomas Newcomen, Matthew Wasborough and Nikolaus Otto. Fact 3: Who invented the Steam Engine? In 1698 Thomas Savery combined the force of steam with the pressure of the atmosphere to patent the first crude commercially used steam powered atmospheric engine, but his design had some problems and others improved on his idea over the years. Fact 4: Who invented the Steam Engine? Thomas Savery's pump of 1698 had just used the vacuum to pull the water up created his vacuum inside a cylinder and used it to pull down a piston. However in 1712 Thomas Newcomen created his vacuum inside a cylinder and used it to pull down a piston. His device was referred to as the Newcomen engine which was first used to drain a flooded coal mine at Tipton, in South Staffordshire. Fact 5: Who invented the Steam Engine? In 1780 a Bristol engineer called Matthew Wasborough built the 'Pickard Engine' for James Pickard adding a crank, a rod, and flywheel to Thomas Newcomer’s self acting atmospheric engine. Fact 6: Who invented the Steam Engine? In 1783 the Scottish James Watt 1736 - 1819 invented the double-acting steam engine in which steam acted on each side of the piston as opposed to just one side, making it possible for the engine to drive machinery in numerous manufacturing industries. Fact 7: Who invented the Steam Engine? In 1784 James Watt patented his steam locomotive that included a separate condenser connected to the cylinder by a valve enabling the condenser to cool the used steam while the main cylinder was hot. Fact 8: Who invented the Steam Engine? By 1790 the James Watt Steam Engine became the main design for all modern steam engines. Fact 9: Who invented the Steam Engine? The inventor of the Steam Engine, James Watt, was born on January 19, 1736 in Greenock in the west central Lowlands of Scotland died on August 25, 1819. Fact 11: Who invented the Steam Engine? Following his education his first job was as an engineer and mathematical instrument maker making compasses and quadrants. Fact 12: Who invented the Steam Engine? James Watt studied the Newcomen steam engine and discovered that it wasted energy. 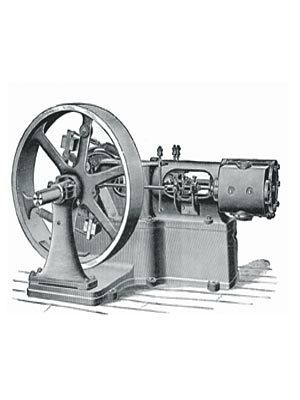 He went on to design an improved machine in which the steam was condensed in a separate compartment of the mechanism. Fact 13: Who invented the Steam Engine? In 1764 James Watt married his cousin, Margaret Miller, and the couple went on to have six children. Margaret Miller Watt died nine years later in 1773. Fact 14: Who invented the Steam Engine? In 1769 James Watt patented his steam engine invention, with the separate condensing chamber, as the "New Invented Method of Lessening the Consumption of Steam and Fuel in Fire Engines". Fact 15: Who invented the Steam Engine? The invention of the Steam Engine was a major advancement to the progress of the Industrial Revolution. In 1774 James Watt started a business in Birmingham with Matthew Boulton to manufacture his improved steam engine. In March 1776 the Bentley Mining Company started using their newest piece of equipment - a Boulton-Watt steam engine to pump water from mines. Fact 16: Who invented the Steam Engine? The invention of the James Watt Steam Engine saw several modifications and improvements and in 1781 he converted reciprocal engine motion to rotary motion and patented the 'sun and planet' gears and the double-acting engine. The improvements made by James Watt increased engine efficiency by a factor of about five, saving 75% on the costs of coal required to run the engines. Fact 17: Who invented the Steam Engine? In 1785 James Watt was elected fellow of the Royal Society of London. Fact 18: Who invented the Steam Engine? In 1790 James Watt's invention of a pressure gauge virtually completed the Watt Steam Engine. Fact 19: Who invented the Steam Engine? His invention of the Watt Steam Engine was a great success and sold to various industries and companies including flour mills, cotton mills, iron mills and paper mills. His steam engine was also used in rivers, canals, distilleries and waterworks. John Fitch invented the Steamboat in 1791 revolutionizing river travel in America. Fact 21: Who invented the Steam Engine? James Watt died on August 25, 1819 at his home "Heathfield" in Handsworth, Staffordshire. The flair for inventions ran in the family. A descendent of James Watt called Robert Watson-Watt invented Radar in 1939, a crucial means of defence during World War 2. The Legacy of James Watt: His legacy was his invention of the Watt engine which was a major addition to the rapid progress of the Industrial Revolution because of its incorporation into numerous industries and fundamental changes in working practices and principles. Higher pressure engines were later combined into single units which was compact and light enough to be used on steam boats and rail locomotives. Nicklaus Otto went on to invent the Internal Combustion Engine in 1876 when kerosene, diesel and petrol were used in place of coal making the invention of automobiles possible.